English painter. His father Enoch Seeman the Elder (b c. 1661), a painter of Flemish origin, brought him to London in 1704. 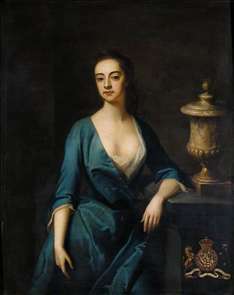 The younger Seeman s earliest known painting is Colonel Andrew Bisset and his Family (Castle Forbes, Grampian), an ambitious group portrait of somewhat uneven quality, in the manner of Godfrey Kneller. From 1717 Seeman enjoyed royal patronage, executing a full-length portrait of George I in coronation robes (c. 1730; London, Middle Temple); this patronage was sustained through the late 1730s with a portrait of George II (Windsor Castle, Royal Collection). In 1717 he painted the well-known full-length portrait of Elihu Yale (New Haven, CT, Yale University Art Gallery), and in 1738 an exceptionally lively portrait of Sir James Dashwood (New York, Metropolitan Museum of Art). Seeman maintained his position in the second rank of portrait painters, producing a considerable number of portraits that were competent, but made little concession to individuality of feature, particularly in the case of the male sitters, such as Abraham Tucker (1739; London, National Portrait Gallery). He was a good copyist and executed a number of copies of Tudor and 17th-century portraits, such as Lady Diana Cecil (Dunham Massey, Ches, NT). His last and largest work is Lady Cust and Nine Children (1743; Belton House, Lincs, NT). See more details about "Portrait of Henrietta Louisa Jeffreys"